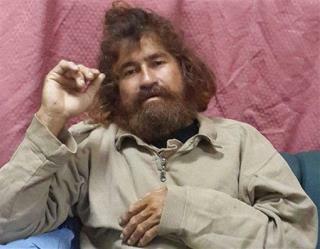 (Newser) – Jose Salvador Alvarenga seemed in pretty good shape when he washed ashore last week after what he said was more than a year lost at sea. Today, however, the Salvadoran—sporting a short, new haircut and a shave—appeared a lot worse for the wear and needed help entering his hotel in the Marshall Islands. "He was much weaker, extremely tired looking, much less animated, and was speaking extremely slowly. He looked exhausted, frankly," a witness tells the AP. "I would say he made an impression that is really now far more consistent with the journey he said he made." Though the Daily Mail notes Alvarenga is to fly to El Salvador today, the AP reports officials say it could be a while longer as more hospital checks are needed. Sort of like jet lag -- keyed up for so long to survive, now he needs to rest. Rest Rambo. He was probably running on adrenaline, after having been rescued after such a long ordeal. They should let the guy rest. It doesn't seem odd to me, that knowing he's now safe, his mind has relaxed and his body is also relaxing and showing the actual toll of his ordeal.